Hellzapoppin’ (H. C. Potter, 1941) – Make Mine Criterion! The Criterion Collection, a continuing series of important classic and contemporary films presents Hellzapoppin’. Make way for the nuttiest, zaniest, wackiest film this side of the loony-bin! Comedy team Ole Olsen and Chic Johnson blast through the fourth wall and demolish the musical-comedy genre, playing Ole Olsen and Chic Johnson, production assistants to a fledgling stage revue. Hellzapoppin’s screwball romance story takes a backseat to the daffy hijinks and absurdist gags that tear at breakneck speed through this play within a film within a film. Inspired by the comedians’ highly successful Broadway show and adapted to mock the filmmaking process, Hellzapoppin’ is a singular work of celluloid irreverence where ANY SIMILARITY TO A MOTION PICTURE IS PURELY COINCIDENTAL! During Hellzapoppin, the audience had bananas, beans, ‘pottie-seats,’ eggs, and live chickens hurled at them; loud shots exploded; planted hecklers raised a rumpus; a ticket scalper cavorted up and down the aisles with tickets for a rival show; a clown tried to extricate himself from a straightjacket for the show’s duration; an elderly woman, outraged that her dress had been lifted by a trick gust of air from under the stage, attacked the entire cast with her umbrella … A woman persisted in bellowing ‘Oscar, Oscar’; the audience was bombarded with rubber snakes and spiders; and a whirling madness of cacophonous pandemonium and blatant boorishness engulfed the theater. Raffles were held during the show, with one planted winner presented with a block of ice which sat on his lap for the remainder of the program. Humorous public addresses were announced and a man periodically wandered through the production attempting to deliver a tree growing ever larger. Olsen and Johnson would first arrive on stage in all manner of contrivances – in a beat-up jalopy, carried in by harem girls, sometimes just stumbling in by accident. This bedlam was not admired by esteemed theatre critics, but the public loved this nuttiness and the stage show ran for 1,404 performances, a record at the time. The celluloid version of Hellzapoppin’ is held together by a rather conventional screwball romance. Kitty Rand (Jane Frazee) loves struggling stage producer Jeff Hunter (Robert Paige). Aware that her wealthy parents will not approve of him unless he becomes a success, Kitty organizes a preview show in the family estate’s backyard theatre grounds in an effort to entice backers for the show. Kitty’s parents prefer Woody Taylor (Lewis Howard) for her daughter’s suitor and the kind but dim young man is essentially engaged to Kitty. Jeff loves Kitty but his friendship with Woody prevents him from acting upon his feelings. Olsen and Johnson arrive as Jeff’s prop-masters, along with Chic’s sister Betty (Martha Raye), who promptly set her sights upon Pepi (Mischa Auer), a real Russian prince masquerading as fake royalty. When Woody mistakes Pepi’s night of forcible loving at the hands of Betty as a marathon tryst with Kitty, he reveals his heartbreak to O&J, who in turn plot to ruin Jeff’s stage-show to ensure that his relationship with Kitty is grounded before it can take off. It would all be rather conventional in its tribulations were it not for the utter zaniness loaded throughout the picture and regularly getting in the way of its conventional plot. If Get Crazy measures it gags by the minute, then Hellzapoppin’ does so by the second, and the film imports many of the revue’s jokes. The jalopy arrival, the growing tree, the block of ice, the gunshots, the lifted skirts, the public addresses, the calls for “Oscar!” – they’re all there and more. 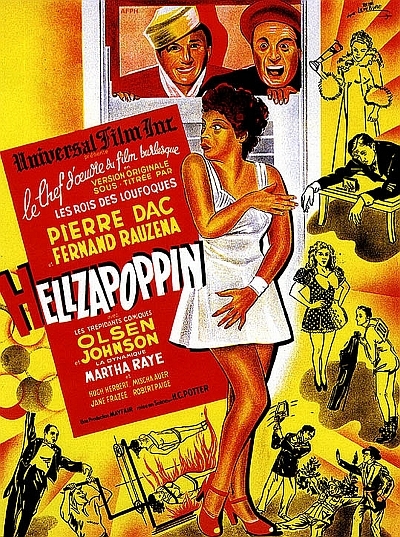 But what makes Hellzapoppin’ truly memorable (talking bears on pogo sticks notwithstanding) is the fact that it doesn’t try to merely reproduce its crazy stageshow on film, but rather converts it into something particular to celluloid. which is screened by Cousin Louie (Shemp Howard), a projectionist showing the movie at the Universal Theater, overtly depicted immediately following the Universal Pictures logo. Clear? Not really? It shouldn’t be, and it only gets more complicated from there. Hellzapoppin’ satirizes the process of Hollywood adaptation, frequently mocking commercial cinema’s demands for linear stories and romantic plot lines – credit Olsen, Johnson, and Marx Brothers scriptwriter Nat Perrin with the uncompromising nature of the compromised adaptation. When asked why everything has to be changed, the director exclaims, “This is Hollywood. We HAVE to!” Olsen and Johnson seamlessly walk through set after set, flipping costumes automatically and cracking jokes throughout (including an intertextual yuck over the “Rosebud” sled and a wondered “I thought they burnt that!”). As Kitty and Jeff attempt to have their passionate duet, notices are posted over the film requesting that “STINKY MILLER GO HOME! !”, frustrating the emotional tone until a figure in silhouette stands up from the supposed audience and leaves. Cousin Louie, the projectionist, is conflated with the controlling power over the film, preventing the movie from progressing when the camera’s perspective becomes fixated on a beautiful woman in a swimsuit, when O&J come under fire by an erroneous reel change that relocates them into a Western picture, and when O&J are divided onscreen by a jumped frame line caused by Louie’s projector being jarred. Hellzapoppin’ translates its gags specifically for the cinema at all backstage levels, mocking adaptation, production, and exhibition through its writers, directors, cameramen, projectionists, and theatre-goers. These moments of intervention, where usually passive film figures address the projectionist or the audience or where normally passive viewers hijack the film, suggest a degree of interaction and control by spectators typically suppressed by classical narration. This form of kooky distanciation brings to mind J. Hoberman’s concept of “vulgar modernism,” which attempted to embrace the work of low-cultural artists as deserving of high-culture regard due to their classical training, their Brechtian techniques, their reflexive and intertextual awareness. 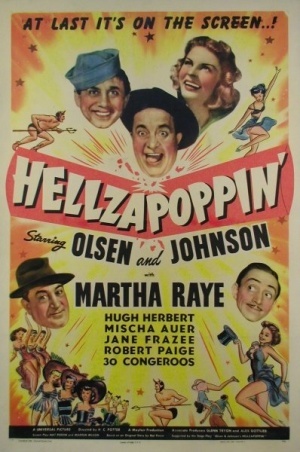 Hellzapoppin’ seems the poster child for Hoberman’s loose concept, and its worth noting that both Olsen and Johnson studied music formally before hitting the vaudeville circuit – Johnson studying classical piano at the Chicago Musical College and Olsen graduating with a music degree from Northwestern University. Naturally, we’d love to see the Criterion Collection provide such high-cultural endorsement to Hellzapoppin’, letting O&J make that “C” extra wacky! One moment of backstage performance stands out and leaves us wondering. In an astounding sequence, Whitey’s Lindy Hoppers, billed as the Harlem Congeroo Dancers, perform a stunning dance number with music from Slim Gaillard, Slam Stewart, and The Six Hits. For some, it is the greatest dance sequence ever committed to film and that might be true, but we’re most interested in how it ends – with the dancers and musicians fleeing upon their discovery by Jeff, Chic, and Ole. Is this some kind of backstage commentary on the division of performers in Hollywood by race? The vivacity and athleticism of the Lindy Hoppers number stands in contrast to the dull ballet performance in Jeff’s show, but the flight of “the help” is so abrupt, so nearly panicked, that it suggests something taboo. African Americans have no place in Hellzapoppin’ beyond the Lindy Hop number, and the barest suggestion of that divide being spanned sends people running. On one level, it’s a gag too, but it’s one with some darkness to its edge and some awareness in its non-integrated conspicuousness. Two final notes on Hellzapoppin’. First, the film remains without a hard media release in North America apparently due to an ongoing dispute between the estates of Olsen and Johnson over the rights to the stage revue, a sad circumstance when one considers that the two men are laid to rest next to one another in adjoining graves and that this clash prevents O&J’s most notorious work from being better known. Fans of Criterion will be aware of the significant influence that artists’ estates have had on films being included in the Collection, so hope exists that these issues could be resolved with some cooperation and that this most unclassical example of classic Hollywood could find a wacky “C.” Secondly, in a circumstance that seems pulled directly out of the film itself, Hellzapoppin’ received a Oscar nomination for the song “Pig Foot Pete” despite the fact that the song actually appeared in the film Keep ‘Em Flying (Arthur Lubin, 1941), a movie that wasn’t even eligible for a nomination that year! That may be our favourite cinematic fact EVER! Hellzapoppin’ is major work of American comedy. Its influence can be seen in the films of Mel Brooks, in Rowan & Martin’s Laugh-In, and in Mystery Science Theatre 3000, to name but a few examples. Its vaudevillian promise that “anything can happen and it probably will” creates an absurdist tone that borders on the surreal, giving this low-culture masterpiece the veneer of high-culture intelligence. In short, it’s great and a Criterion Collection edition would not merely provide accessibility to a scarcely circulated film, but it would offer the care and attention deserving of this important work. And who better to provide a cover treatment to Hellzapoppin’ than John K., whose warped, low class, retro-style would perfectly suit the “vulgar modernism” of O&J’s comedy and Potter’s film. Let’s see that Criterion label get the Spümcø treatment! 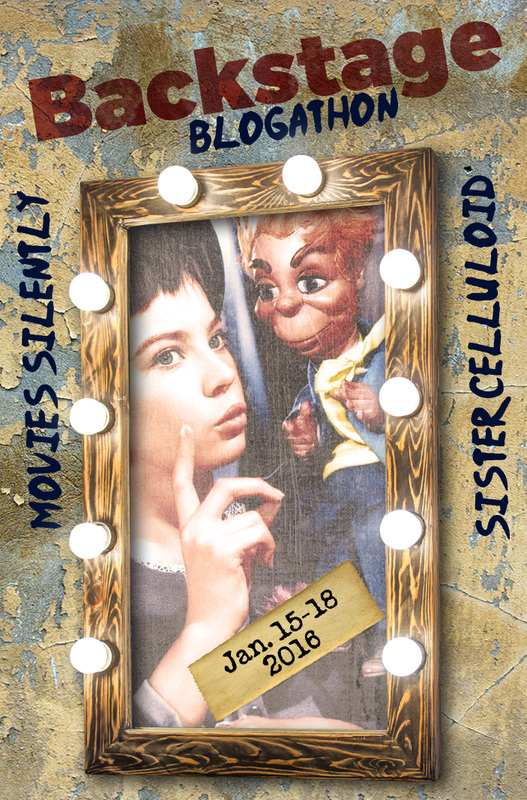 And thanks again to Fritzi and Janet for organizing the Backstage Blogathon and letting us participate! Head over to their blogs and enjoy some more tales from beyond the proscenium arch! “Hellzapoppin'” has only been a title to me, but now that I know what I have been missing I feel like a truly deprived individual. My sincere (honestly, not sarcastic at all) thanks. My pleasure! I’d say I was in your shoes (just a title to me too) until about 6 months ago when I finally tracked Hellzapoppin’ down. I hope you get a chance to watch the embed. Like all the film I choose, I think it’s worth it! Thanks so much for joining in with this fascinating selection and hurrah for O&J finding a way to skewer the Hollywoodization of their work. I will definitely have to track this one down. Thank you! This was an inspired theme for a blogathon. I have never heard of this comedy team and I feel deprived. I laughed heartily at the Coat of Arms joke! Too funny. I want to see this film and hope to one day. What a shame that the families can’t unite as this comedy duo did. I think that line about telling cab drivers to go to hell may be one of the funniest lines committed to film! Thanks for the comment. Thanks for bringing this film to my attention – I’m guilty of often overlooking comedy films (if you’re having fun it can’t be meaningful…!) but I’m very happy to be proved wrong! Thanks! I’m a big believer that it’s easy to make people cry and hard to make them laugh. I’m glad to have made a convert, even if just for one movie. I have bookmarked this page to watch the embed later. (Thanks for doing that!) It looks like too much fun to miss. I can’t believe this film wasn’t on my radar, but it sure is now! Blast! I misread that in my enthusiasm. Perhaps we can start a petition. I first heard of this weird title a few days ago, but it seems to be really interesting! I mean, being in the audience viewing the Broadway play must have been better, but I can only hope to check the film and have as much fun.